Teachers know that the period between Christmas vacation and Spring Break can be long and arduous for both student and teacher. Cold weather, gray skies, and a lengthy stretch of school after the excitement of Thanksgiving and Christmas can create some weary students. So, when a teacher gives a creative assignment during this period, it really does help the days pass by more swiftly. Catching the attention of students is both challenging and rewarding. With that in mind, let me share with you about a recent experience that brought all this back into focus for me again. Last week a friend from high school, Tari, came by to visit. Her niece, Natalie, came with her. Natalie is a senior at Tari's and my alma mater. This creates a point of interest for us, as we like to reminisce about days gone by, what our friends are doing now, and of the adventures we had. I'm afraid Natalie gets lots of advice from us, but she takes is very well. When Natalie arrived she was holding a baby carrier. I thought "that's unusual, she must be babysitting". But it didn't take long to realize that something else was going on. Natalie had a gender specific computerized doll in her baby carrier. I remembered my own teaching days and instantly realized that the flour sack or egg babies that my students tended for their Consumer and Family Science projects were very low tech compared to the very realistic props used today! I also felt very 'dated' in comparison! The purpose of the 'infant simulator' is to help the student realize the care that a newborn requires. Each doll is about the size and weight of a newborn. They are programmed to cry, coo, and burp on a schedule that the teacher programs into them. They cry audibly and loudly when they need a diaper change, food, rocking, or burping. Care is given by feeding them with a baby bottle that has a special sensor in it that records its use. The doll also responds to rocking, burping, and a diaper change by specific prompts that its internal computer recognizes. Natalie had a special wristband that the teacher put on her (and that she could not take off) that recorded things she did and how quickly she responded. I suppose this factor was added so that mother or grandma couldn't 'babysit' for her, thus giving her full responsibility for the baby doll. 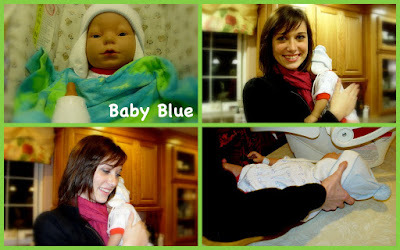 Natalie used great care to keep the doll's head stabilized and to handle it gently, as sensors would record baby abuse. Every time Natalie changed a diaper or fed the baby doll, her journal came out and she recorded every task with care. Students are graded according to their actions and tender loving care. The computer makes it impossible to cheat. I'm sure Natalie will receive an A+ on this project. She was diligent in meeting the needs of this demanding little bundle! I think she'll agree that she found 100% infant care no easy task. She said the looks she received from those nearby who thought her baby was real were sometimes a bit judgmental or curious. One mother offered to trade her the computerized doll for her real baby (I'm sure she was simply making a point). With a baby doll programmed to exist on the same sleep and wake schedule as a regular newborn, I suspect that deep sleep and diligent homework in other school subjects was not quite as usual. And I suspect that Natalie, as did the rest of her class, decided that the glamorous aspects of being a young parent were best delayed until maturity, readiness, and the adventures of youth were well past. It really was fun sharing an evening of Natalie's 'project infant simulator' with her! Great job, Natalie. I know you will make a terrific mother someday. . .when you are ready. Great project and one every student should experience. I do remember the egg babies, but this is so much more. Thanks!